We just recently set up a reef tank in the office and wanted a cool way to check on it while we were away (we are total dorks, we know). So, we decided to set up a webcam. It was cheap and easy and with No-IP, you can check in online, even if you have one of those pesky dynamic IPs. Don’t have a fish tank to watch? The options are limitless! Monitor your front door, security for your office, your refrigerator, or anything! Just make sure that you aren’t invading anyone’s privacy or breaking any of these laws. Step 1: Buy a webcam. You can find a cheap one online, we ordered ours from Amazon. Step 2: Place your camera where you would like it. 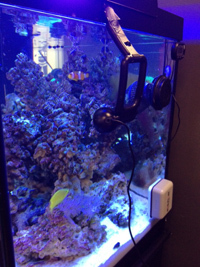 Our reef tank cam is attached with electrical tape to the side of the tank. We also have other office cams that are mounted to the ceiling. Step 3: Have a dynamic IP? In order to see your webcam easily over the Internet, you will need to create an account with us. Create an account from the homepage. After you fill out your credentials and receive your account verification email, login to your new No-IP account. Create a new host, leave all of the information that is already clicked the same. Behind a router or firewall? You will have to forward your ports. Note: Our documentation on port forwarding is limited due to the vast amounts of routers. Please check out your routers support page for more information if you are lost. Download and install our Dynamic Update Client. Our DUC will automatically keep track of your dynamic IP changes. Or you can see if a devices at your network supports No-IP.com for Dynamic DNS updates. Some devices that include No-IP for Dynamic DNS can be Routers or Camera systems. This will remove the need of they Dynamic Update Client. Now, you just need to check to see if everything is working correctly. You can go to www.portchecktool.com to confirm that your ports are forwarded correctly and that you can view your reef cam from the web. Step 4: Once you have completed the above steps, it is time to login to your camera via the host you created to see what your fish are up to! You just need to make sure the webcam’s software is launched and ready to accept Internet connections. Step 5: Voilà! A quick and easy way to set up a webcam on a dynamic IP address. Enjoy!